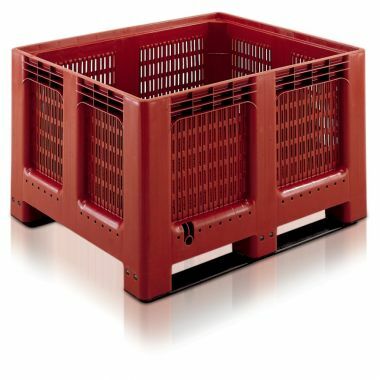 G Force supply a range of industrial quality plastic pallet boxes, plastic bulk boxes, folding pallet boxes and Dolav bins ideal for handling, transporting and storing large or heavy loads. 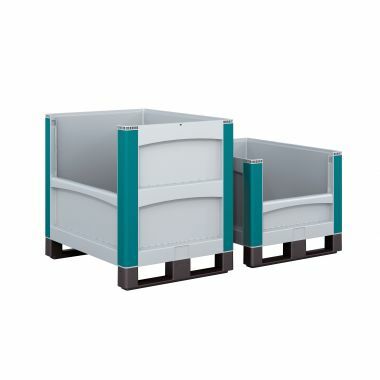 The range includes plastic pallet boxes with 2 or 3 runners or skids. 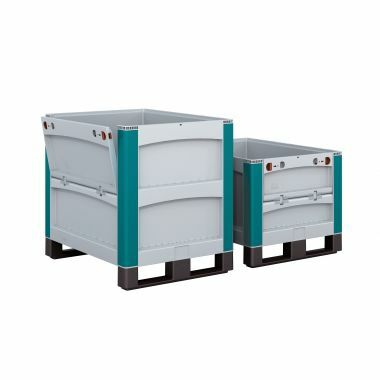 Pallet boxes with 3 runners are suitable for lifting, rotating and tipping on set of forks. Optional plastic lids are also available for the plastic pallet boxes. All of the pallet boxes we supply are produced in hard wearing plastic which is hygienic and easy to maintain. As with all our plastic products, our pallet boxes will not rust or corrode enabling them to be used in wet or damp areas and washed down when required. They can also be used to store other clear plastic storage boxes within them so you can see their contents easily during transit. Pallet boxes are a great alternative to steel stillage’s or wire mesh box pallets. Plastic pallets are much lighter, provide more protection to contents, will not rust or corrode, offer quieter handling and can work out much cheaper. Pallet pallet boxes can be supplied with solid or perforated sides and base. As the name suggest a solid box typically has no openings or holes in the sides or base, offering a water tight large container with all round protection for the contents. A box with perforated sides provides ventilation and airflow keeping the contents of the container fresh and allowing drainage. All of the pallet boxes can be supplied with optional lids. 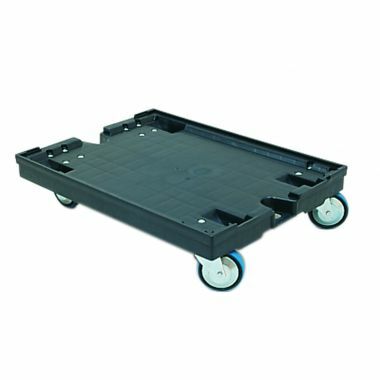 Foldable or collapsible pallet boxes are the ideal box for many logistics applications. The boxes can simply be folded down when not in use, saving valuable space when the boxes are empty. This can help reduce transit costs and save warehouse space. Like a rigid box, when assembled the boxes can be stacked with or without lids. Which Pallet Box should you buy? We offer a number of different types of to choose from, with different sizes, solid sides or perforated sides, rigid or foldable formats all available in our extensive range. Pallet boxes can be supplied with solid or perforated sides and base. As the name suggest a solid box typically has no openings or holes in the sides or base, offering a water tight large container with all round protection for the contents. A box with perforated sides provides ventilation and airflow keeping the contents of the container fresh and allowing drainage. All of the pallet boxes can be supplied with optional lids. All of the boxes we supply are produced using hard wearing plastics which is hygienic and easy to maintain. As with all our plastic products, our pallet boxes will not rust or corrode enabling them to be used in wet or damp areas and washed down when required. This makes them very well suited to food and pharmaceutical production environments where hygiene is paramount. Whilst they are big and bulky containers, our boxes are stackable which enables them to be safely stacked up when in transit or storage. If colour coding is a requirement we can supply pallet boxes in a choice of colours, allowing colour coding to be applied and enabling efficient segregation of product. Overall our extensive range of pallet boxes provide bulk storage, handling and distribution solutions. Plastic pallet containers are a great option for many industrial applications; contact us today for more information. Plastic pallet boxes are often an essential piece of equipment for warehouse industrial environments, and are often used for handling large amounts of items, equipment or stock. They are large boxes which are used for storage and transportation of stock and items; specially made to ensure ease of use in an industrial environment and perfect for a workplace. They feature access channels and pallet footings which allow them to be easily moved on a hand pallet truck or fork lift truck, depending on the load and destination. They can also be stored steadily on pallet racking, as they have skids and runners, allowing them to be moved with stability and ensuring peace of mind when in storage. Pallet boxes are ideal for storing and transporting large amounts of stock, as they are very sturdy and secure, and are built to withstand the strains of everyday wear and tear. Made from tough, durable materials, our pallet boxes are also long lasting, reusable for years and will not rust or corrode, unlike other alternatives such as wire mesh pallet boxes. Pallet boxes are an investment, as they are durable and sure to last a very long time, even when being used very regularly for tough jobs. They can withstand being transported on lorries and from indoors to outdoors, as they are fully waterproof and they are wipe clean, ensuring your company items are perfectly hygienic and presentable. They can be used for storage of food items or even pharmaceutical stock, as the boxes are easily kept hygienic and can be labelled, ensuring ease of identification of the products stored within them. What are Plastic Pallet Boxes Used for? 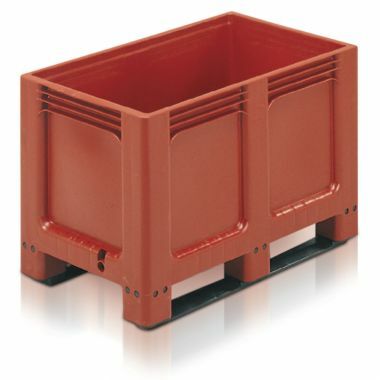 The main use of plastic pallet boxes is within industrial environments such as warehouses, and for transportation of loads on lorries. Depending on the type pf pallet boxes you purchase, they can be used to transport mostly anything, from food items and pharmaceutical items, items or furniture, to delicate items and electrical goods. Pallet boxes are perfect for storing and transporting a large quantity of items, as they have a large capacity. They can hold a heavy load as they are particularly sturdy. This makes them the ideal piece of equipment for companies who specialise in handling large amounts of stock, and companies who need to transport large amounts of equipment in an easy and hassle-free way, be it from one end of the warehouse to another, or from one country to another. These kind of pallet boxes are ideal for transporting goods overseas, as they are particularly durable, sturdy, have a large capacity, and are practical in terms of moving around. They are made from very strong plastic, and can be easily handled using the correct equipment, labelled to ensure they proceed to the correct location and can be easily identified when they arrive at the destination you wish to transport them to. Our boxes are ideal to store items for a lengthy period of time, for example if you were selling expensive goods such as pieces of furniture or electrical goods which may sell at irregular periods, you could keep the items in stock for a lengthy period of time until you sell them. This will ensure they are there for when they are needed, but otherwise are safely in the warehouse until the time arise. Our pallet boxes are ideal for this type of use because despite their bulky and large nature, they stack neatly and securely onto each other when they contain stock or equipment, and inside each other when they are empty. 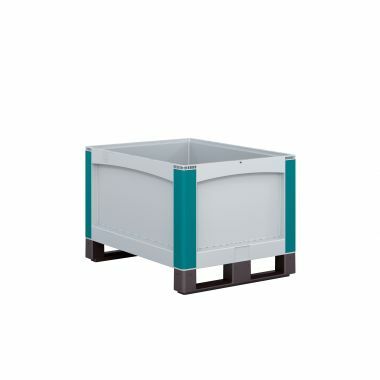 What size plastic pallet box should I purchase? With such a range of items to choose from, and in all different sizes, it can be difficult to decide which product will best suit your business needs. Pallet boxes from G-Force come in a massive range capacities, with the lowest capacity being 145 litres and the largest capacity being 780 litres. Being the ideal storage and transport for a bulk load of items, G-Force supply boxes which range from 145 litre capacity to 780 litres capacity. You should choose the size of your pallet boxes according to the quantity and size of items you wish to transport or store. It is likely that if you are using them for an industrial business, you may decide to purchase a number of plastic pallet boxes, in which case you should think about the space you have available for your pallet boxes. A particular factor to take into consideration is your available shelving height. It may be wise to take measurements around your warehouse before you commit to buying your products. You may also want to consider your method of transportation. If you are planning to use pallets, a fork lift truck or a pallet truck, you may wish to consider what size you have available and plan the size of your new pallet boxes around this. If you wish to purchase tote boxes to put inside the pallet boxes, you may wish to also consider the sizes of these too to ensure maximum usability. When buying from G-Force, you can easily arrange for all your storing and transportation items to correspond, allowing for ease of use of all your items together. 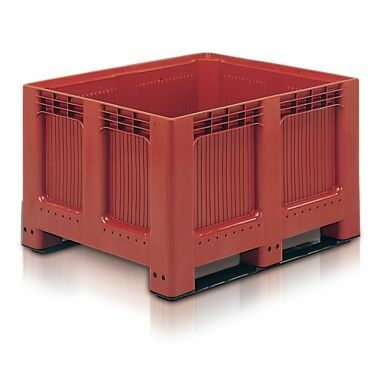 Which Type of Plastic Pallet Box Should I buy? Pallet boxes from G-Force can be purchased with either solid or perforated sides. It is essential to choose which type of pallet box you should purchase according to the items you will be storing and transporting within them, and how the items will need to be stored, either long term or for the duration of the journey you are transporting them to. If you are transporting electrical goods, stock, or valuable items which cannot be exposed to any outdoor weather conditions, you should choose solid sided pallet boxes, as these ensure a water-tight, air-tight containment for all products. There are no holes or openings in the sides, top or base, therefore your items will not be affected by any weather conditions and they are entirely protected within the box. Alternatively, if you are using them to store or transport food items such as fruit and vegetables, you should use boxes with perforated sides to ensure air flow to your goods, and allow for drainage if need be. Sometimes it is necessary to colour code your stock and items, which can be easily done with G-Force products which come in a range of different colours. This will ensure that your stock and items are easily identifiable to warehouse staff and others involved in the transportation process, such as lorry drivers. G-Force offer a range of sizes and styles to suit all your needs. We also offer products which allow for use of transportation and storage with measurements to coincide with each item. G-Force are located in the heart of England, and are specialists in supplying equipment for the workplace, with expert knowledge of the equipment we sell, and only supplying you with the most quality products for the best prices. If you wish to purchase multiple products, we may be able to offer you a discount on your items, and all items for sale come with free delivery for your own ease of ordering.